What does “high availability” mean in practical terms? 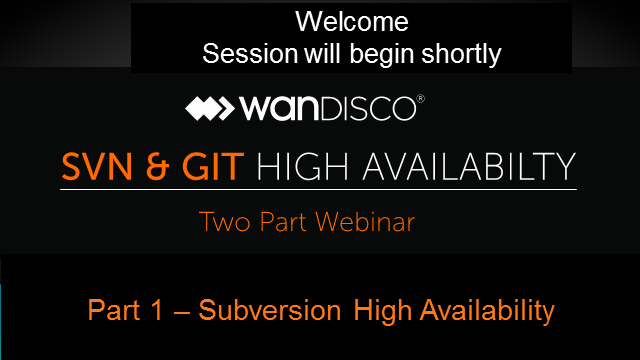 Join us for a free two part webinar detailing what it takes to make your Subversion or Git deployment highly available, including some of the trade-offs to expect. If you’ve got questions, this webinar is your chance to get answers from our Senior Product Manager and resident expert Doug Robinson. Enterprise development teams are frequently working with multiple types of SCM repositories, such as Git and Subversion. Git does a solid job handling source code; Subversion does a solid job handling binary artifacts and is likely where many older projects' full histories reside. Managing both Subversion and Git repositories together is quite a challenge. Join us to learn how to make it easy. Join our free webinar detailing what it takes to make your Subversion deployment highly available, including some of the trade-offs to expect. Source code management systems contain the crown jewels of a software company's intellectual property. Effective auditing gives you a picture of who's accessing that IP and when changes are being made. This information can satisfy compliance and security requirements and give you new insights into your development practices. In this webinar we'll explore standard and extended audit reports available for Subversion and Git administrators. As Git has grown in popularity many IT organizations are wondering if migrating from Subversion to Git is inevitable. The two have different strengths architecturally and support different models of development. This webinar will describe how to ensure you provide developers with the most appropriate tool. Get a glimpse into a recently commissioned TEI study of WANdisco SVN MultiSite Plus. The subject is a Fortune 500 company with annual revenues of over $5 billion with SVN MultiSite in production in the US, UK and India. The study concluded that SVN MultiSite generated a return on investment (ROI) of 357% with a payback period of less than two months. •Enables distributed teams to collaborate at LAN speed. Been a long-time user of Subversion or Git? Are you considering switching from one to the other or using a hybrid environment? This webinar will outline the advantages of each while providing insight into the most common use cases that inform the decision to use Subversion or Git. What does “high availability” mean in practical terms? This webinar will detail what it takes to make your Subversion deployment highly available, including what you’ll need and some of the trade-offs to expect. Join us for a discussion of this major Subversion release. As Git gains in popularity and Subversion extends its features for enterprise development, the two often operate side-by-side. This session will outline the benefits of each system (centralized vs. distributed), and how to best support a hybrid deployment. For years ClearCase was the standard for enterprise SCM. If you had a large number of developers and lots of projects ClearCase was a great choice, while ClearCase MultiSite provided basic support for distributed teams. Now industry trends are converging toward a new generation of development tools and processes. Today, continuous delivery brings agile development and DevOps together, promising much shorter development cycles and higher quality. Learn how moving from ClearCase to Subversion can improve your development processes and significantly reduce deployment cost and complexity. You'll also learn practical ClearCase to Subversion migration techniques. Stefan Fuhrmann, WANdisco. Stefan is a Subversion core committer focusing on Subversion server performance. Client/server software like Subversion can be a black box to administrators, making it hard to identify the root cause of performance problems. In this session, we'll outline common issues and provide step-by-step instructions to help you find and eliminate bottlenecks quickly. What defines ‘good’ SCM performance? What do you need to measure? Especially if you're migrating between tools, it's better to ask these questions before developers start to complain. This webinar will examine key indicators of SCM performance and how to measure success in your organization. Randy DeFauw is Director of Product Marketing for WANdisco’s ALM products. With extensive experience in development tools and processes, he focuses on real world challenges and brings customer requirements directly to his product oversight role. Prior to joining WANdisco, Randy worked in product management, marketing, consulting, and development. He has years of experience applying Subversion and Git workflows to modern development challenges. Modern enterprises demand highly available SCM systems to power their development and delivery pipelines, but what does it take to get availability close to ‘nine 9s’ with Subversion or Git? In this webinar we’ll take a look at best practices and hardening techniques learned from years of administration experience. Over the last decade, many organizations have created global development teams for delivering applications, which creates unique challenges in automating and accelerating delivery cycles. In this webinar, Forrester Principal Analyst Kurt Bittner will describe the challenges of Distributed Continuous Delivery and how leading organizations are addressing these issues. • What is Continuous Delivery? • What is Distributed Continuous Delivery? • What are the benefits of Distributed Continuous Delivery? • What unique challenges are presented by Distributed Continuous -Delivery? • How are organizations solving these challenges? WANdisco allows large, widely distributed development teams using Subversion to truly work as if they are in the same location with continuous availability across the enterprise. Our webcasts cover topics such as continuous delivery, DevOps, scalability, availability, performance, and access control.